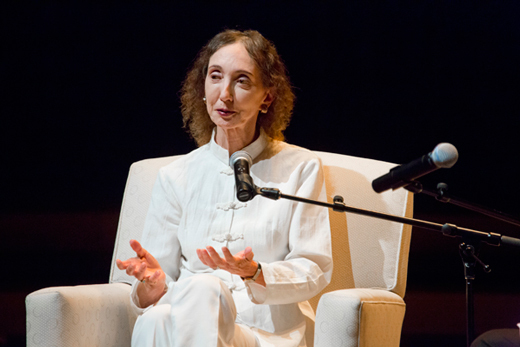 Joyce Carol Oates appeared at Emory's Schwartz Center for the Performing Arts on Aug. 29 as the keynote speaker for the Decatur Book Festival. Emory Photo/Video. When Joyce Carol Oates was 14 years old, her grandmother gave her the gift of a typewriter, a tool that would eventually help pry open a world far beyond her modest, rural roots in upstate New York. Throughout high school and college, Oates began to explore creative writing, establishing the foundation of her craft by producing story after story, novel after novel — a habit of hard work that she would never abandon. Today, Oates is considered among America's most significant and enduring contemporary authors, a versatile literary powerhouse as comfortable producing short stories, poems and essays as she is penning plays, children's books and award-winning novels. Oates shared the power of her words and her wit — and a preview of two of her latest books — before a capacity crowd at Emory's Schwartz Center for the Performing Arts on Friday, Aug. 29, as the opening keynote speaker for the 2014 Atlanta Journal-Constitution Decatur Book Festival. During introductory remarks, Decatur Book Festival Program Director Philip Rafshoon described Oates as "a writer's writer and an American literary treasure," adding that she is often best known "by her extraordinary work ethic and the depth and breadth of her personal canon." In addition to thousands of short stories, essays and articles, Oates has published dozens of novels and volumes of non-fiction over her career. "Actually, she's so prolific that at this moment it is not possible to tell you how many books that she has written, because throughout our welcome and introductions, she's backstage in the green room … finishing another book," quipped Rafshoon. "But perhaps her greatest strength as a writer is her ability to write with verve in nearly every literary form and genre," he added. The evening unfolded in easy conversation, as Oates took the stage along with her authorized biographer Greg Johnson, a former assistant professor in English at Emory who earned his PhD in English here in in 1979. Johnson has written extensively about Oates and her work. For Oates enthusiasts in the crowd, it was nirvana — an opportunity to better understand the inner writing world of a gifted author. Their discussion covered such essentials as how and where Oates does her writing and how teaching influences her own work; she has taught at Princeton since 1978, as well as visiting appointments at other universities. They also discussed her willingness to tackle dark, weighty topics rooted in socio-political realities, and her unwavering passion for the short story format. Oates read excerpts from her most recent releases, the short story collection "Lovely, Dark, Deep: Stories" and "Prison Noir," an anthology of stories written by U.S. prison inmates that she edited. When asked "Why do you write fiction?" Flannery O'Connor answered, "Because I'm good at it." I wonder if you identify with this response or would you have a more nuanced answer? "I think Flannery O'Connor would have been really good at Twitter. She has all these wonderful one-liners… and she's not afraid to be funny. I don't think most people who are writers or artists really feel that they're good at it. I feel that most of us are trying and we're sometimes failing and dissatisfied and exasperated…"
"In just one morning I can have a gamut of emotions, from despair and despondency to mild curiosity over where this is going. I think that we all tell stories — our species is a storytelling species. And we love to tell stories, and we love to hear stories. So a writer or artist is someone who takes that impulse a little farther. I think there are many reasons we write or create art. Some of them are conscious and I think many of them are unconscious…"
You've been a world traveler lately. How do you maintain your concentration on writing such complex works while traveling? "I stay home a lot, too — I'm probably home most of the time. My average day is just so wonderful, it's completely quiet. I'm in my study on the second floor of my house, looking out over my garden… it's fairly wild and overgrown and has beautiful flowers. And I have my cat, often right next to me, and some birds at a feeder; I would say that's the definition of my life." "I remember my friend Norman Mailer said people are surprised to discover that novelists basically are at home, sitting and writing." You've been at Princeton for a number of years and before that you taught at other universities. Evidently, the academic environment has been very congenial to your writing. "When I asked John Updike why he didn't want to teach, he said that he felt young writers sort of sucked his vitality, like vampires, they took his life's energy from him. And I feel just the opposite. I really enjoy my students, and they're not all young! There's just something wonderful about people who care deeply about writing and who bring their stories and chapters of novels for us to read. Such an intimate sharing … there is something almost mystical about it." You have published close to 1,000 short stories in your career, a passionate devotee of the form since the beginning. Why is this form so appealing? "I just find it extremely fascinating. First of all, there is a story that you want to tell that exists as a kind of amorphous feeling … almost like a musical phenomenon. In other words, there is no language to it. You want to tell the story of how you loved your grandmother or how your grandmother loved you. Or you want to tell the story of how the first person you loved betrayed you and broke your heart … but you don't have the language for it; it's almost like a feeling, an ache in the heart. So the first stage is a feeling. "But the second stage is trying to put it into language. I find that so challenging. Is your language going to be poetic or very plain? Will you have a lot of dialogue? Should it be a monologue? Could it be written in short choppy sentences or should you use long Proustian sentences? Should you have really short chapters? Long chapters? To me, all of these things are quite fascinating, because the story could be the same story, but it could be told 100 different ways. To me it's very exciting … to try to find the right form." How does movement motivate you as a writer? "I do a lot of running and walking fast — that's where I really do a lot of my writing, in my head. I remember when I was a girl and I lived on a small farm, some nights I couldn't sleep and I would go outside in the light of the moon (and) run along our long driveway. There was such a feeling of some strange romance, smelling the fresh air — it was almost unspeakably exciting and beautiful." "(Now) I run in my neighborhood. There is a country road that goes up a hill (near my house). There actually are cattle up there and sheep. And when I run up that hill — I'm not making this up — I feel that there will be ideas waiting for me, it's like they're waiting for me up in that place. So I run up there. And I get ideas for structure. If I just sat in a room it wouldn't be the same thing."